After work one night I decided the open grain of the red oak needed some color so I mixed up some dark and burnt Cyprus umber with some BLO and painted on a coat. This was less of a stain and more of a very thin oil paint. The added color worked out perfectly so after letting it dry for two days I sprayed on multiple thin coats of amber shellac and let it dry over night. It’s hard to believe that seat is just plain old poplar. After living with the chair for a few weeks I may adjust the design some but in the meantime the eucalyptus seat blanks need to be assembled. After pinning the crest rail and some “making pretty” it was time for stain. I raised the grain with some water and let it dry overnight. After knocking down the grain I applied some of the same stain mixture from the bench however I poured out the top without storing up the pigment and watered it down substantially. Last night I applied a coat of linseed oil that was thinned with turpentine (true turpentine). I’m debating adding some pigment to the second coat of oil, similar to what I did with the bench, but I am not sure yet. I did end up with some uneven staining that I did not notice until it had dried but I’m hoping it will be less noticeable as the process continues. 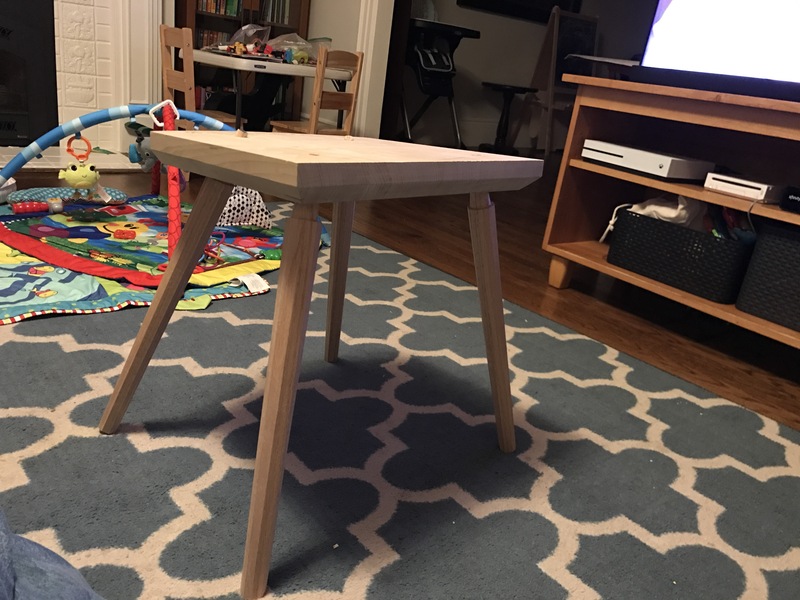 I finally had time to assemble the first chair. Tomorrow I will pin the crest rail to the spindles and start the cleanup process. It’s been pretty quiet on the blog lately but that’s because it’s been pretty quiet in the shop. Partly this was do to work (which has been busy and I’m scheduled to testify in a case soon) but the primary reason was a sense of disgust in my own failure. 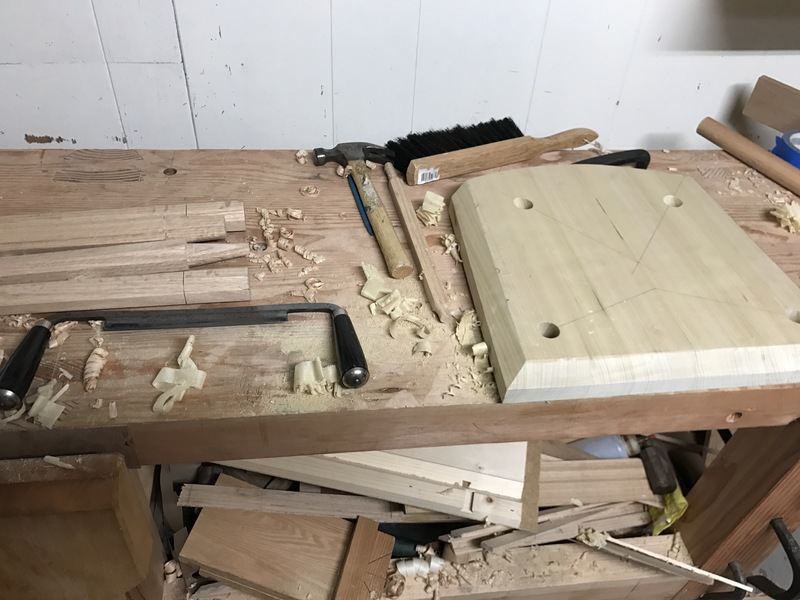 While I was leveling the chair legs I discovered that my workbench has developed a pronounced twist which has been the source of my troubles with chair seats (and probably explains why the dining table bench rocks slightly). This was very discouraging and it took me a while to get back in the shop. This past weekend I finally got around to cleaning up the messy garage (when I’m busy with work things get a bit messy) and part of that meant finishing up the chair. I got out the miter box and trimmed all of the bent crest rails and shaped the spindles. My hide glue expired in September but my garage is quite cool so I decided to test it with some scrap prices. Hopefully I can get this chair assembled thus weekend and free up enough space to re-flatten my bench. I always forget how much fun a sharp drawknife can be. 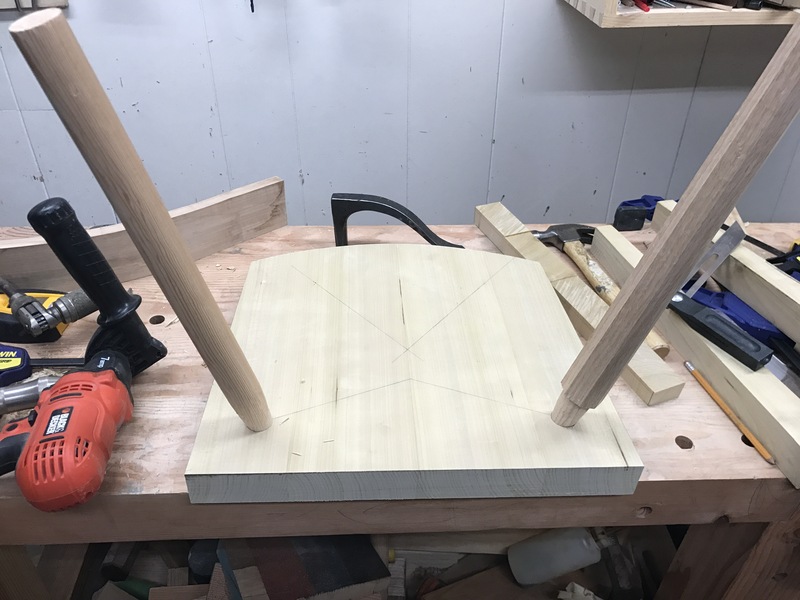 I beveled the chair seat with a mixture of hand saw, drawknife, and my #5 1/2. Then after about an hour I had the tenons shaped on all four legs and in place. This seat is much thinner than the back stool so I will be reamming out the mortices more for extra meat. My original plan was to leave these seats flat (mostly because carving the Eucalyptus intimidated me) but I might saddle this seat a bit for fun. Work is looking like it’s going to be hectic through the end of the year so I am sneaking small bursts of work in when I can. This past week has been focused on legs (though I’ve been cycling through the steam bending every two days) and if not for some home repairs the undercarriage would have been complete. 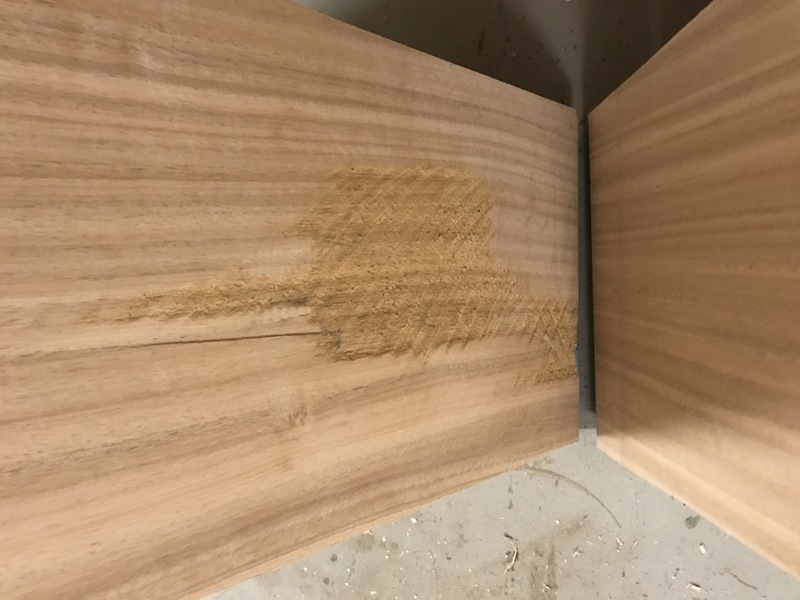 After milling the blanks to 1 5/8ths thick square (and 34th inches too long) I marked out the shoulder of the joint three inches from one end. This was then sawn down 1/4 inch on all four sides, a much easier activity with everything square. 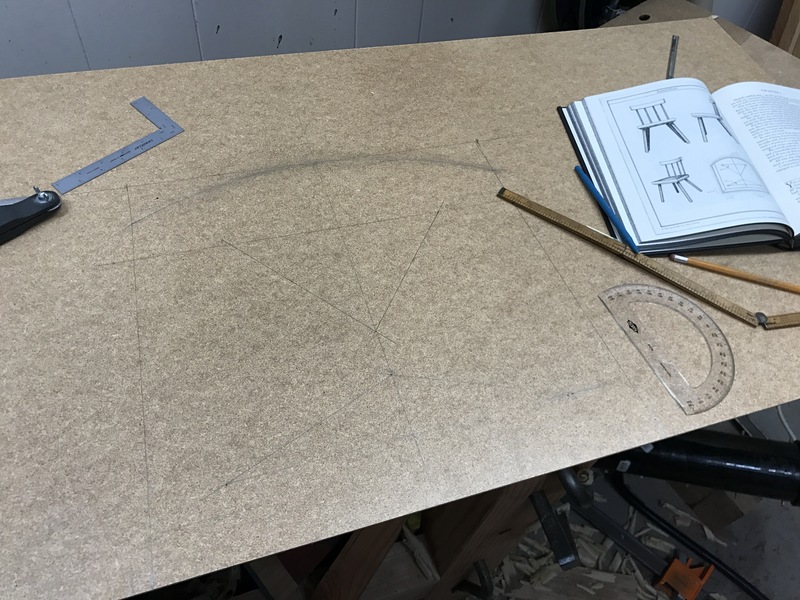 Next I used my compas to lay out final diameters on the bottom and marked tapers that would make the legs the target 1 1/2 inch thickness at the shoulder. 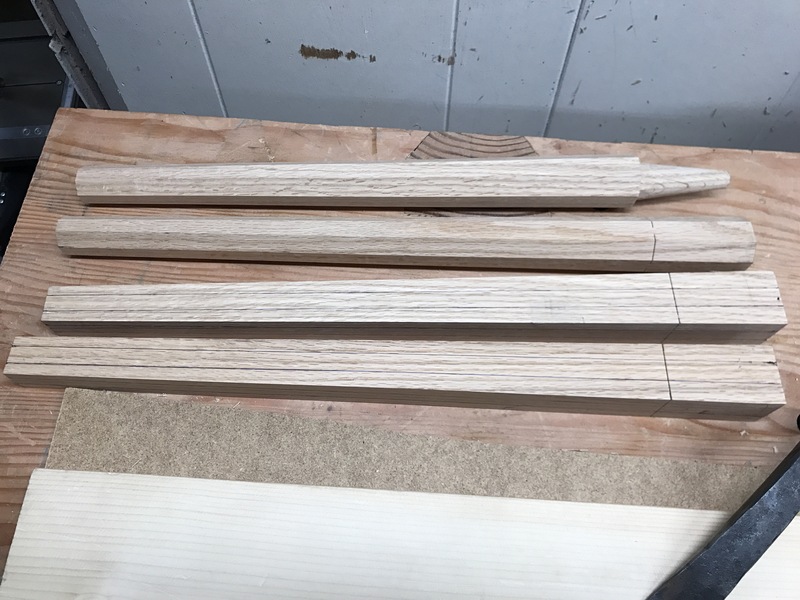 These were then put through the band saw and planed smooth on two sides before the process was repeated on the other two. Now that I have my system down, I’ll take some pictures of my markings as I’m fixing the process very easy this to around. The legs in various stages of completion. I also put together a cradle to hold the legs in place which the cornered are being removed. This dramatically sped up the process compared to using a Wonderdog. Unfortunately, on Friday night I noticed one side of the garage door (original carriage doors) was sagging so much that it was not letting it close properly. After a quick inspection it became clear that the thermal cycles have finally overwhelmed the joints which started to slip. 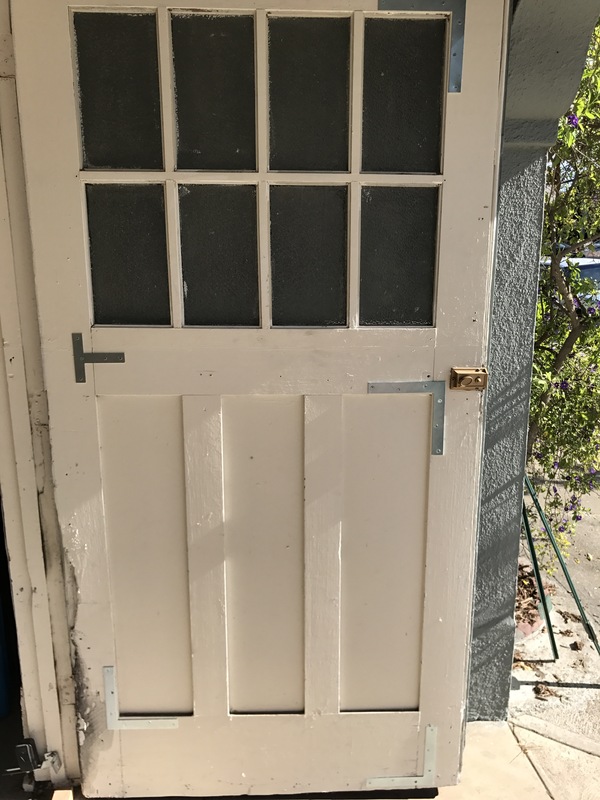 After using bar and pipe clamps to bring the door mostly back together I secured it temporarily so it can still function without destroying itself. A full refurbishment will take more time than I have right now but it will need to be done. The past few months have been pretty light on shop time for a variety of reasons. First I was sick, then there was a month long series of interviews for what would have been a major career change and move (didn’t work out), and then September and October were warm and sunny which was more conducive to yard work and family time. But now the fog is officially back and the nights are getting longer so I am back in the shop. There has been a lot of milling recently and the eucalyptuses seat blanks in particular have been wearing me out. 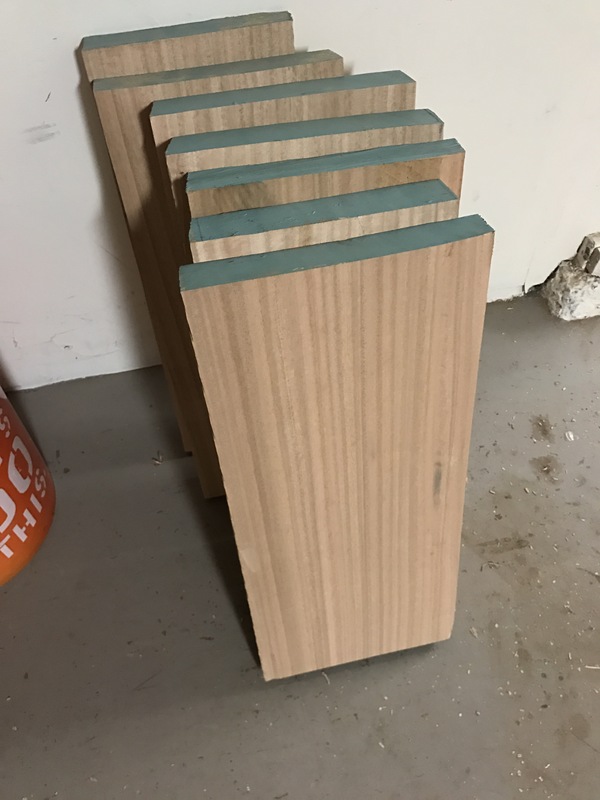 Between their weight and hardness combined with the weird way the dried (the middles of the boards collapsed so I lost a lot of thickness), I think it will be a long time before I work with Tasmanian Blue Gum again. 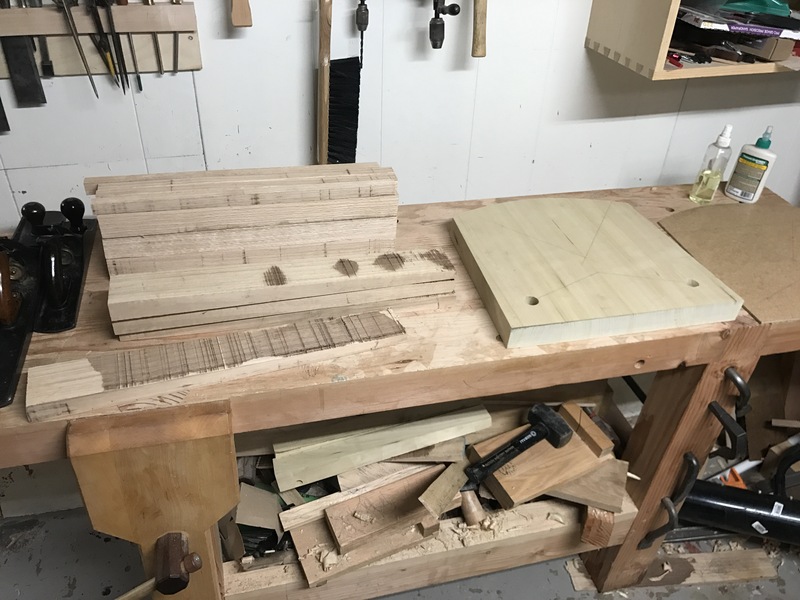 I did get a seat template made that will make layout easier and joinering more consistent. 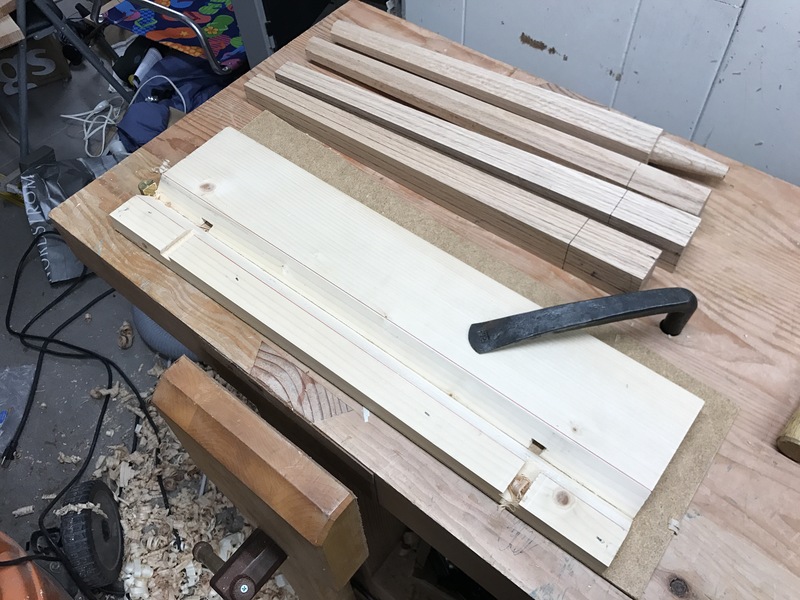 I have been using this to make a first pass in polar and red oak. This weekend I manned to rough mill leg and spindle blanks and made some tapering re-saws to straighten the grain for the crest rail blanks. I’m hoping I end up with at least four good crest tails and seat blanks.